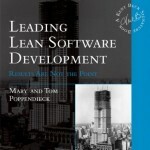 Home » Posts » Lean Manufacturing » Lean for Software Development: Is it a Silver Bullet? We interviewed Mary Poppendieck in which she answers my reader’s questions. Today, she answers a question about Agile being a Sivler Bullet. 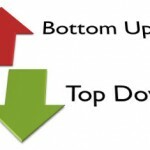 Should Lean be Top-down or Bottom-up? 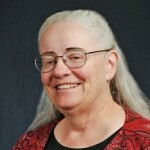 Today, Mary Poppendieck responds to Corey Ladas‘ question on the relationship between Agile and Lean and what to make of all the methodologies in software engineering. Lean would seem to allow for a broader set of ideas and practices than some Agile adherents would find acceptable. For example, SEI Team Software Process seems closer to Lean both in spirit and in pedigree than much of the Agile body of practice, yet many Agilists regard Watts Humphrey as a villain. 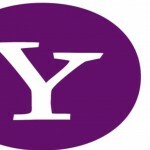 Has Agile become the new orthodoxy? How does Agile add value to Lean? Will the prejudices of the Agile community limit the progress of Lean ideas within software development? When do we get to drop the Lean/Agile qualifier and just be Lean? Hi Corey. I have seen and admire your work in Lean Software Engineering, and I often refer people to your excellent website. I recently had the opportunity to work with a superb open source team that had a much deeper understanding of top notch software engineering practices than I find in most agile environments. 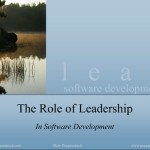 I observed that “by-the-book” agile practices are hardly the only way to develop great software. As you know, when the lean principles of pull and flow are combined with good software engineering practices, the results might not fit the agile mold, but they can be quite dramatic. Agile and lean are just the latest in a series of good software development approaches that I have seen rise in popularity over the years. They join the ranks of software engineering, structured development, JAD, rapid prototyping, CMM and others…. Every one of these approaches has been used to great effect in some companies, while others adopted it in search of the elusive silver bullet. It seems that every seven years or so, our industry has to learn one more time that software development is complex, challenging work that takes skill and discipline to do well. What changes over time are the tools available to do the job well; what never changes is the simple fact that there is no such thing as a silver bullet.